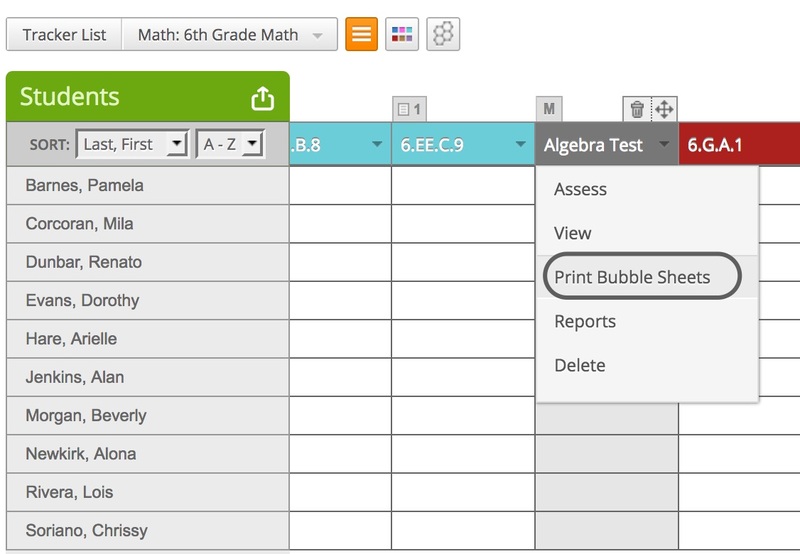 In addition to delivering an assessment with a web browser you can print bubble sheets and then score the assessment with GradeCam. Note: Bubble Sheet scoring is not be available for assessments that contain rubric criteria or technology enhanced items (TEIs). TEIs must be assessed electronically and cannot be scanned by bubble sheet. Click on Trackers, and select the tracker that contains your assessment. As you look at your tracker, you'll notice that the multi-standard and benchmark assessments have black headers, and they also have a tab on the top with either a B (benchmark) or an M (multi-standard). Hover over the header and select Print Bubble Sheets. In the Print Options section, you'll see selections for including the student ID, the assessment name, and the teacher name on each bubble sheet. Select the check box for each option you want to include. Click on Print Bubble Sheets to print them, or Download Bubble Sheets to save them to your computer.